On October 19, 2015, Governor Abaraham Ataruri declared West Papua a conservation province. This declaration was based on the desire to maintain the wealth of natural and cultural resources in West Papua and manage it in a sustainable way for the benefit of future generations. Seven of the 13 regencies and municipalities in West Papua also declared their support for the conservation province. 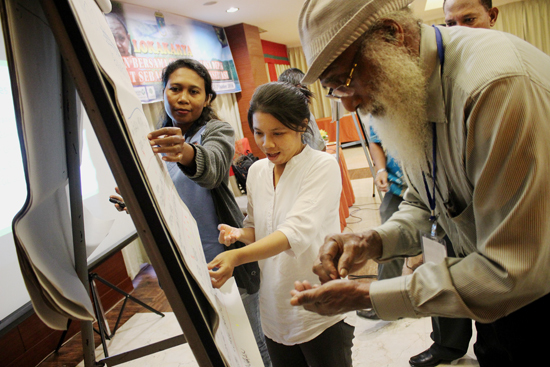 To support the sustainable development planning process in West Papua, the Working Group on the Conservation Province worked with CSF Indonesia to initiate the scenario planning process. The process of scenario planning is one way to understand possible future conditions in West Papua and establish a shared vision that can be used as a reference in determining the sustainable development strategy for the province. Group discussion during scenario planning workshop. West Papua has made a number of important steps to position itself as a conservation province. In 2011, West Papua’s Provincial Government issued a white paper on this initiative. After the declaration in 2015, the Governor formed a Working Group on the Conservation Province, responsible for preparing the draft of a Special Provincial Regulation on Conservation Provinces. The Working Group also coordinated with government institutions responsible for sustainable development planning in the region. The members of the Working Group consist of representatives from the provincial government, the legislatures, People’s Council of West Papua, the State University of Papua (UNIPA) and international conservation organizations (Conservation International, World Wide Fund for Nature, and The Nature Conservancy). The Scenario Planning Workshop, held in September and October 2016, aimed to create more public discussion and strengthen the concept of a conservation province from multiple points of view. The scenario planning process consisted of an academic seminar on September 5th, development of thematic background studies for the rest of the month of September, the Scenario Planning Workshop in Manokwari from October 3rd – 7th, and a Planners Workshop on October 10th and 11th. Ranking important elements of development. Through this process participants developed a realistic forecast of West Papua's condition in 2030, seen from the perspective of economic development, education and human resources, ecosystem-based tourism, a reduction in extractive industrial activity and investment, and good governance. Participants then had an opportunity to review the draft of the Special Provincial Regulation on Conservation Provinces and give their input. For the last sessions of the workshop, the results were presented to members of the government agencies involved in crafting the Medium Term Development Plan (2017-2021) for West Papua. This was an important meeting for unifying the development and conservation efforts in the province. The results of this workshop will continue to be used by the Working Group to influence the draft of the Special Regulation and the Medium Term Development Plan. Participants, facilitators, and staff at the scenario planning workshop. CSF Indonesia will continue to support the balance between conservation and development in West Papua and facilitate inter-stakeholder dialogues as the Special Regulation makes its way from the provincial level to the central government.